Editor's note: CNN.com's David Challenger journeyed along a stretch of the Silk Road that is inside China. This is the fourth entry in a five-part travelogue recounting that journey. (CNN) -- Although the Xian train station was even more tumultuous than the one in Taiyuan, all had gone smoothly until I boarded the wrong carriage. 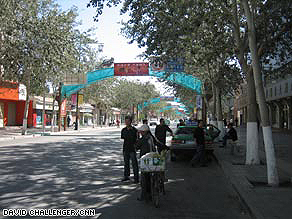 A crystal-clear day greeted my first foray into Dunhuang, which has wide boulevards and tree-lined streets. Inside was chaos; people shoved and yelled at each other, while others fought to place their luggage up on to the already bulging overhead racks. One woman behind me thought she'd reach her seat quicker by repetitively elbowing me in the kidneys. I finally found the correct carriage and entered my empty compartment, which consisted of two bunks with four beds, one small table, and a thermos for hot water. There was no toilet inside -- they were situated at either ends of the carriage. One was a western-style sit down version, the other a squat. Both were dirty, and the hand-wash basins were already clogged. In an adjoining dining carriage -- in which the smoky atmosphere was not dissimilar to pea soup -- was an Australian guy who was working as a tour guide along the ancient Silk Road. He'd only been living in China for one year, yet his Mandarin was already quite good. He was clearing about A$15,000 ($12,500) a year, but as he enthused, "It's not about the money, it's the experience." On returning to my carriage, I found a middle-aged guy already asleep in one bottom bunk, and an elderly chap, somewhat forlornly, sitting on mine. His ticket was for the upper bed, but I knew he'd never make it up the ladder, so I swapped with him. Lights went out at 11 p.m. and I was quickly sound asleep. By the time I'd arisen it was midday, so I headed back to the dining carriage for more passive smoking and lunch. Outside I took in my first view of the countryside as the train wound its way up through the Hexi Corridor in Gansu Province -- once the sole thoroughfare for Silk Road travelers. The landscape I viewed reminded me a little of the flat Australian Outback, although a few snow-capped peaks could be seen far off in the distance. While the skies were still gray, the clear air afforded good views of the Great Wall's western most point, near the town of Jiayuguan. Back in my compartment, the old guy had been joined by his wife. Although we couldn't communicate, they proved charming and great company. I did learn they were heading home to Hami, a town about half way between Dunhuang and Urumqi. As we shared tea and approached the transit station of Liuyuan, I noticed the skies had cleared completely and the large, deeply red setting sun was casting a mesmerizing tint of dark browns and yellows over the vast treeless plains. Finally, after 26 hours, I departed the train. The station's car park was full of taxis and without haste I was on the 1.5-hour journey south to the oasis town of Dunhuang. The next thing I knew I was being prodded awake by my taxi driver. We'd arrived and were sitting outside my designated hotel in the heart of town. I paid him the 80 RMB fare, checked in, and immediately hit the sack. The town center seemed to have a market at every turn, and locals were no longer made up by your standard Chinese variety; here, you're just as likely to meet someone with Mongol, Tibetan or Kazakh lineage as you would a Han. I bought a ticket for the next leg of my train journey to Turpan, for 276 RMB ($36), with little hassle, then headed out to climb the massive sand dunes of Mingsha Shan -- just 5 kilometers (3 miles) from the town's center. (View and listen to the audio slide show on Dunhuang and scaling Mingsha Shan on a camel). The following day I headed out to Dunhuang's other must-see site -- the Mogao Caves, which house some of the world's most impressive Buddhist art. I'd negotiated an 80 RMB ($10.50) taxi fare for the 30 km (18.5 miles) trip, while the guided English tour of the caves cost 120 RMB ($15.70). The drive out was amazing. After leaving the green surroundings of Dunhuang the country side quickly turned flat and dry, making me think of the camel trains that once plied their route with silk and other goods in this area 2,000 years ago. On returning to Dunhuang, I checked out of my hotel and jumped on to a small bus to rejoin the train at Liuyuan, which cost 20 RMB ($2.60). The dilapidated, 30-seat capacity bus was crammed with 40 other men, almost of all whom were smoking. In the areas I've been to in China, the vast majority of men seem to smoke (whereas very few females do). This is supported by World Health Organization statistics, which states the percentage of men and women smokers in China stands at 67 percent and 4 percent respectively. The WHO also says that one of every three cigarettes consumed worldwide is smoked in China. Consequently, 3,000 Chinese people die daily due to smoking-related diseases. I was relieved to have scored the front seat of the bus and the use of a seatbelt. I may have been bombarded by passive smoking, but at least I'd improved my chances of surviving death in the event we hit an angry, rogue camel. An hour after arriving back in Liuyuan, I boarded the train to Turpan. It was much nicer than the Xian to Dunhuang locomotive, being fully air-conditioned and more spacious. I'd also been given a cabin by myself. Most of the other cabins seemed to be full of Japanese tourists. Indeed, the entire washroom at one end of the carriage was full of Japanese women removing their makeup, even before the train had departed the station. A Japanese man, looking bereft as he awaited outside the cubicle to clean his teeth, rolled his eyes, tapped his watch, sighed, and said " ... women ..."